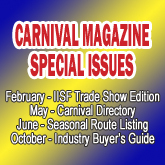 CARNIVAL is the magazine for the carnival industry. Reach potential customers in twelve issues a year, packed with information about carnivals, rides, concessions, events, people, manufacturers and suppliers, trade shows, everything relevant to the industry. Over 40 years strong, CARNIVAL is the best, most trusted way to each the carnival industry. The latest information on new rides, concessions, items that are hot on the midway from the companies that are producing them. CARNIVAL is the only industry publication that is dedicated cover-to-cover solely to the outdoor amusement industry – twelve issues a year of the most entertaining and enlightening material about the business. Let us make your name known in the carnival industry today! 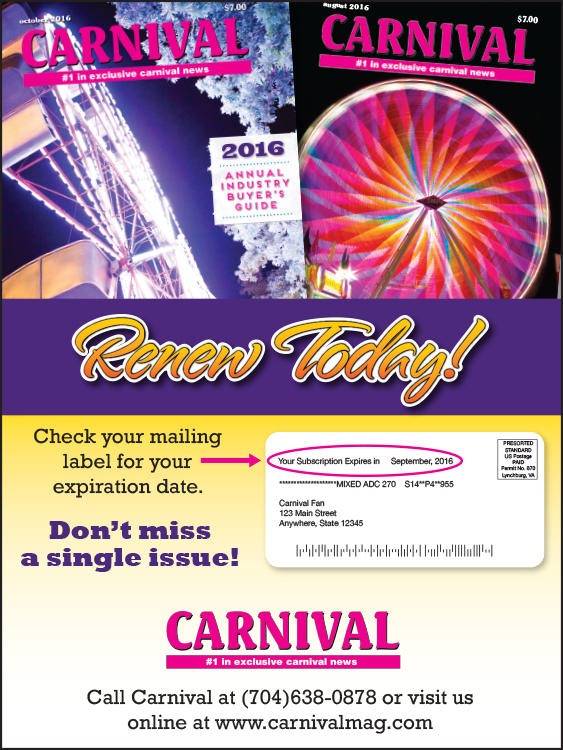 Contact Charles Dabbs, Publisher, to promote your product, service or event in the next exciting issue of CARNIVAL!